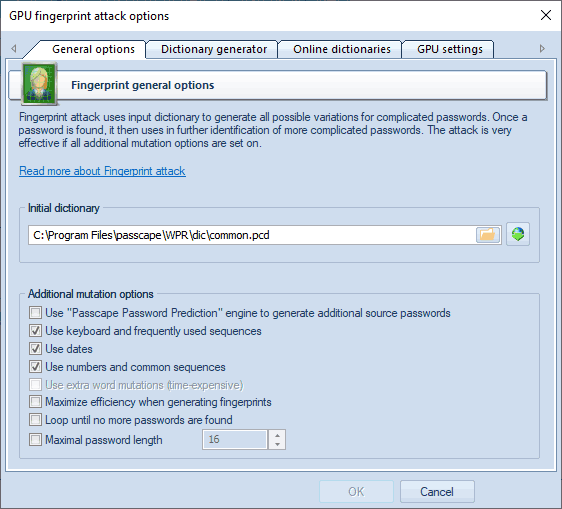 Before launching the attack, specify the source dictionary to be used for creating the fingerprints. The software comes with the common.pcd dictionary, optimized for this attack, but you can use yours or download one off the Internet ('Online dictionaries' tab). There are no certain requirements to the source wordlist, except one: the source dictionary must not be too large; otherwise, the attack will take significant time. You can use dictionaries with national passwords if you suspect that the sought password contains characters in a national encoding. We have got 5+4+3+2=14 fingerprints, not counting the source word. All words from the source dictionary are broken into fingerprints. After this, all the fingerprints are dumped into a single database, naturally, discarding duplicates. So we have got a database of fingerprints that would be used for checking passwords by gluing all the fingerprints with each other and finding the match. The real fingerprint generation algorithm is a bit more sophisticated. Moreover, there is an option in the attack settings, Maximize efficiency when generating fingerprints, which maximizes the efficiency (at the expense of speed) by generating additional fingerprints. Let's take a look at the remaining options. Use PPP engine to generate additional passwords - use passwords found in other attacks when generating fingerprints. Use keyboard and frequently used sequences - add keyboard combinations and common sequences to fingerprint bank. Use dates - add dates to fingerprints. Use numbers and common sequences - use digits and simple combinations of letters. The most careful attention should be paid to the Loop until no more passwords are found. That is where fingerprint attack can really show itself off. Here is how it works: if at least one password is found during an attack when the attack is over, the password participates in generating new fingerprints, and the attack runs again. This option works great on large lists of hashes and on password history hashes. 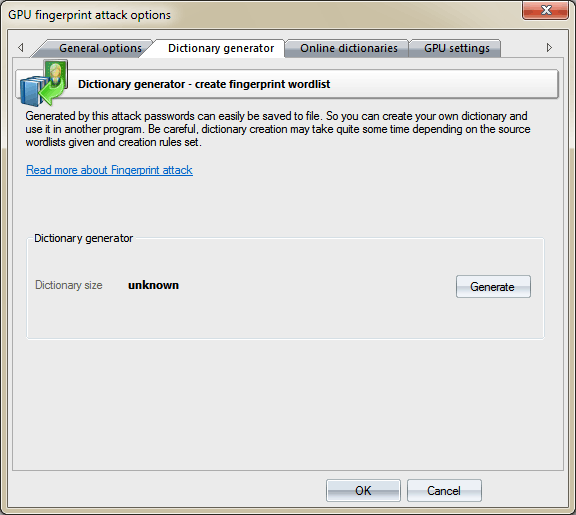 The second tab with the settings allows to create and save a custom dictionary using current options of the fingerprint attack. Be careful; the dictionary may take up a lot of space on your PC's hard disk drive. On the third tab, you can download source wordlists for fingerprint attack from the Internet. Be careful, not all the dictionaries suit fine for the attack. Before you can use it in an attack, you must first select the graphics card in the General Options menu. Setting the number of parallel graphics card’s blocks, where passwords would be searched. Typically, each block consists of 256 threads. Thus, if you set the number of blocks to 256, the GPU will run 256*256=65536 threads. 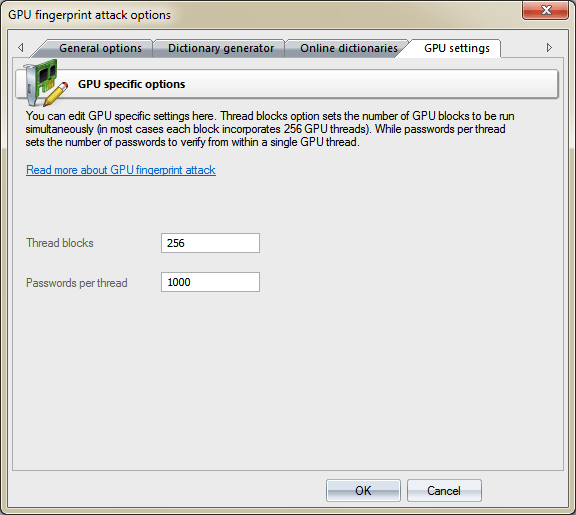 The total number of checked passwords for one call to GPU kernel will be 256*ThreadBlocks*PasswordsPerThread. In our case 256*256*1000 = 65 536 000 passwords. It is recommended to always set the ThreadBlocks parameter to a multiple of 64. Setting the value smaller than 256 on modern graphics cards, in the majority of cases, leads to performance degradation.